Frequent readers know that I'm trying my hardest to get my nails back :( I did this around the same time last year read here! Last December I was offered Nailtiques read here to help get my nails back into the enviable state Besides 3 nails that are constantly growing the other 7 continue to peel. I won't be saying anything bad about Nailtiques as I want to at least give the products a 2 month trial but I honestly think come March 1st if I don't see an improvement I'm going to move on to another course of nail treatment more so in the name of Renunail. Dr. Lewinn's hopefully will be the saviour I need. I've seen such great reviews regarding Renunail so last December when Debenhams was having a sale on selected items I grabbed this set for £25 50% off. 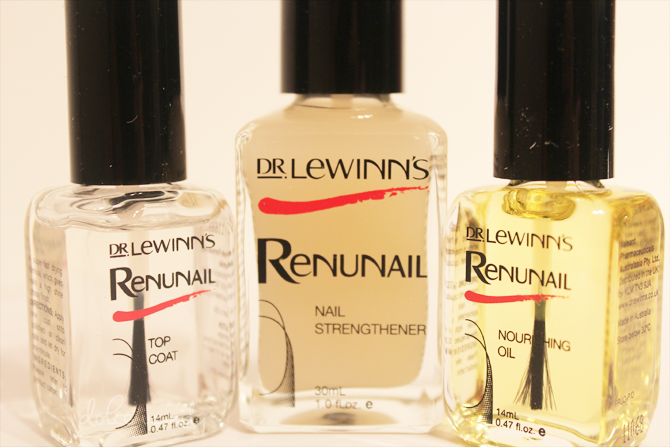 Do you have a favourite Nail Strengthener ? This is soooooo cool. I need somehting like this!